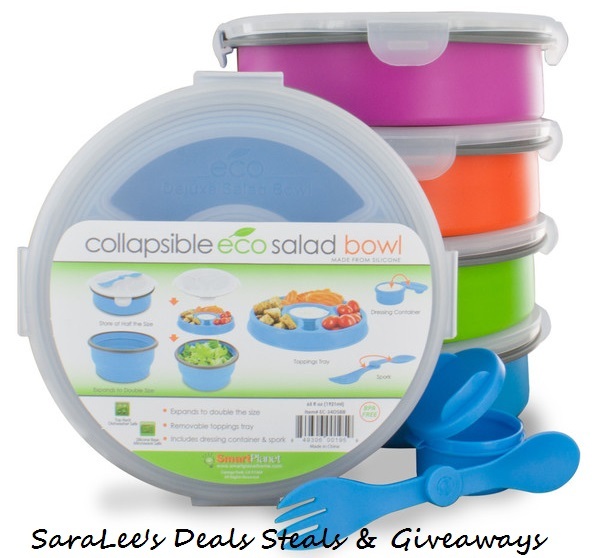 ENTER FOR YOUR CHANCE TO WIN THEIR OWN Collapsible Deluxe Salad Bowl.LIKE THE ONE BELOW AND BE SURE TO CHECK OUT THE FULL REVIEW FROM SaraLee's Deals Steals & Giveaways.ALL OPINIONS ARE HERS! I absolutely love salad and the Collapsible Deluxe Salad Bowl would help me to take salad on the go. Smart Planet carries Household Items with an Eco-friendly twist. If it's good for the environment and it's good for business, then it's good for Smart Planet and our partners. •Silicone Base is Microwave and Dishwasher Safe. Lid is not Microwave or Dishwasher Safe. •Expands to Double the size, push down to collapse and store at half the size. •Includes a dressing container, toppings tray and a reusable spork utensil that stores in the lid! •Available in 4 fun colors (Blue, Pink, Green & Orange)! Now for the giveaway: One lucky person will win a Collapsible Deluxe Salad Bowl. This is open to US, 18+ and ends 11/30/2013 @ 11:59 pm est. To enter, Simply do the tasks on the Giveaway Tools widget below and you're set to have a chance to win! Remember you can't win if you don't enter.